Bulgaria has joined Greece in vetoing the opening of EU accession talks with Macedonia, despite a positive recommendation by the European Commission. Bulgarian President Rossen Plevneliev told EU Enlargement Commissioner Štefan Füle on Wednesday (31 October) that Macedonia is “not ready” to start accession negotiations. This is the fourth consecutive year that accession talks have been delayed. Füle visited Bulgaria in a bid to clarify the government's position with respect to Macedonia. Prime Minister Boyko Borissov has accused Skopje of stealing from Bulgaria's history and badmouthing his country (see background). But Füle got more than explanations and was told that Bulgaria doesn’t see Macedonia as ready to begin accession negotiations. Füle had invested a lot of his political ambition in trying to unblock the stalemate between Skopje and Athens in the dispute over Macedonia's name, which both countries claim. The country's internationally recognised name is the Former Yugoslav Republic of Macedonia (FYROM) but Skopje would prefer to be called simply Macedonia, which is also the name of a northern Greek province. On 10 October, Füle proposed a compromise whereby negotiations would start before a resolution of the name dispute is found. It was the fourth time that the Commission has recommended the start of accession negotiations with Macedonia, and each time the efforts were blocked by Greece. But this time it appears that some momentum has been introduced by Athens for signing a bilateral memorandum, in which both sides would commit to respecting the other’s national sovereignty and territorial integrity, and renounce any territorial claims. The situation looks different today. Plevneliev told Füle in a carefully prepared statement that before expecting any good news from Brussels, Skopje would first have to improve its relations with Bulgaria. “The authorities in Skopje will unlock their EU perspective not through propaganda and marketing campaigns but through actual reforms and actions for good-neighbourly relations,” Plevneliev was quoted as saying by the website Novinite. The Bulgarian president pointed out that Sofia does not deny an EU perspective to Macedonia, and in fact supports that, but takes into account the fact that the former Yugoslav republic is not ready to start talks for EU membership. “Bulgaria cannot grant an EU certificate to the actions of the government in Skopje which is systematically employing an ideology of hate towards Bulgaria,” Plevneliev stated. “It is strategically important for the long-term stability in the Balkans that the government in Skopje starts applying the European approach towards its neighbours, without claims and manipulations. It is high time that the government in Skopje be done with its anti-Bulgarian campaign, and the manipulation of historical facts. The responsible European approach towards one’s neighbours and the next generation is to preserve history whatever it might be,” Plevneliev added. Füle reportedly disagreed with Plevneliev, and argued that Macedonia has been waiting for too long for membership in NATO, which Greece has also blocked, and the EU. “I am one of those people who believe that it is not good to leave our partners waiting before the door for too long. I believe that integration is the best means for coping with nationalism, and I am convinced that isolation boosts nationalism,” Füle was quoted as saying. A diplomatically worded Commission communiqué states that Füle understands Bulgaria's concerns, but urges both countries to solve any open issues in a neighbourly spirit. “I welcome the fact that presidents have exchanged letters, and that Ministers Mladenov and Poposki are contributing to improving relations between the two countries. I am confident that through constructive dialogue and common understanding real progress can be achieved,” the Commission statement said. Nickolay Mladenov is foreign minister of Bulgaria and Nikola Poposki is his Macedonian counterpart. But precisely this exchange of letters has added fuel to the fire. Plevneliev had proposed that Bulgaria and Macedonia jointly celebrate certain historical dates and avoid a nationalist reading of history. One such date is Ilinden, which commemorates an uprising on 2 August 1903 that freed the Bulgarians in Thrace and Macedonia from Ottoman rule. Macedonia has a different reading of the events and denies the role of Bulgaria in liberating its present territory. Much to the disappointment of Bulgarian authorities, Macedonian President Gjorge Ivanov responded to Plevneliev, pretending he didn’t understand the purpose of the proposal. The Macedonian website MINA reported that Ivanov gave Plevneliev three dates which Macedonia would consider celebrating jointly with Bulgaria: Europe Day; the day Bulgaria recognised Macedonia and the day Bulgaria and Macedonia established diplomatic relations. This was seen in Sofia as an offense with Mladenov and Borissov reportedly making statements to the EU commissioner confirming Bulgaria’s determination. These developments took place amid threats by the EU executive to publish an extraordinary monitoring report on Bulgaria’s ailing judicial system, which may have encouraged Sofia to hit back at the Commission at a time when Füle was seeking mediation over Macedonia. Borissov’s populist stance is widely shared, with the opposition Socialist Party signalling that it shares the government’s position on Macedonia. In Skopje, Prime Minister Nikola Gruevski, the leader of the nationalist VMRO-DPNE party, appears as the main instigator of tensions with its neighbours. 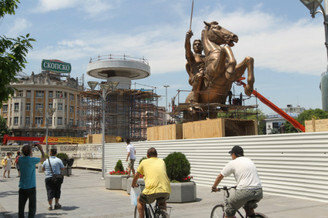 Gruevski’s government has financed statues and arches promoting Macedonian nationalism and has renamed the airport and for Alexander the Great, an historical figure claimed by both Greece and Macedonia. It is high time EU officials and journalists do some reading for a change… There are factual mistakes even in this short article. The Ilinden uprising did not liberate anybody. It was started in 1903 to provoke the great European powers to get involved in defense of the rights of the majority Christian region of Macedonia and force the Turks to give it autonomy. They did not. The Turks stayed. So liberation, of sorts, came after a war in 1912. And yes this is a sad story. And the European tradition of condescending ignorance towards any current issue is a major part of it. conflicts with the greeks, albanians and the bulgarians – leaves macedonia as an exclusively serbian sphere of influence. current macedonian policy benefits only belgrade. belgrade’s strategy is based on the assumption sofia will never commit to turning macedonia into a failed state. this might have been true once. can they be sure Sofia-Tirana axis will never take place? To Peter: Check your facts again. First Bulgarian state was established in 681. Cyrillic alphabet was created in Bulgaria 174 years later in 855. But yes, centuries before the Ottomans arrived. Commissioner Štefan Füle, a Moscow-educated clerk and former member of the Communist party of Czechoslovakia, is trying to score Serbia, Macedonia and Montenegro in EU through the ‘back door’. Is Füle performing the real EU agenda or maybe the agenda of Mr. Putin? Commissioner Štefan Füle, a Moscow-educated clerk and former member of theCommunist party of Czechoslovakia, is trying to score Serbia, Macedonia and Montenegro in EU through the ‘back door’. Is Füle performing the real EU agenda or maybe the agenda of Mr. Putin? @Peter Your facts are still unreliable. Southern Alliance,what are the facts according to you? a)have you read Isocrates letter to Philip. b)have you read the epitaph written by Demosthenes in 338 bc. c)have you read what former PM of Greece in an interview for “New York Times”on Sept.3,1903 said about Macedonia. d)have you read what former PM Mitsotakis in 1995 said at an interview for the T. Skinalis book”For the Name of Macedonia”. Have you read “Black Athena”by Bernald. Have you read what the occupiers of 1913 had signed on August 10th,1920 at the League of Nations. e)Greek high representative to the League of Nations V.Dendramis said in 1925.
f)why did Greece print the Abecedar and for whom. g)Athena Skoulariki a sociology professor at the University of Crete said,and many more. Why would a nation create special police force under the title”Greek Secret Service plan for Macedonians”by Athens police chief Dimitris Kapelaris?. If you want more info I would gladly supply it to you. This page is not big enough to list all the information.I could supply these and other comments event by event,and who what said. Now that Greece has been found guilty by the International Court of Justice for violating the Interim Agreement with Republic of Macedonia, and cannot any further veto Macedonian accession to EU, Bulgaria will assume the role of local troublemaker for EU. Will it follow Greece in its financial predicament remains to be seen. When you want a definite answer, Yes-No, the Balkans dialogue is ineffective! In Republic of Macedonia there is a sick anti-Bulgarian propaganda started from the time of the Serb-Communism until now. They teach us at school fake history interpreted for the needs of the Serbian propaganda. They tell us to hate Bulgaria and Bulgarian people. All books, documents, and letters from our ancestors and today national heroes are manipulated. At every place where it says ‘Bulgarian’ our propagandist replace it with ‘Macedonian’ and after that tell us we have no connection to Bulgaria and Bulgarian people. It is really sick to live in Republic of Macedonia where almost each day they spread to us psychological propaganda to wash our brains. From the other side they make a censure and don’t allow the different opinion to appear in any television, radio, or online newspapers as a message or a comment. Europe, help us! To Peter: I suggest now Gruevski makes you a big monument in the center of Scopie to commemorate your victory over the traditional history! The historians in Republic of Macedonia need to stop to fake the historical facts. What they do is replacing the term ‘Bulgarian’ with ‘Macedonian’ in all books, documents and letters written by our national heroes and revivals. It’s a known fact that almost all Macedonian revivals considered themselves and their language as Bulgarian. To Peter: B. Dimitrov is not the father of bulgarian history, because Bulgaria has real history. The history has fathers only in FYROM because they have fabricated their own history. It is a pity for the young people in FYROM. They are brainwashed and manipulated by people like you. And who is the real fool will be seen after 20 years. And by the way Peter is a greek name…or the world is wrong about that too? When people begin to realize that Empires and States before the 19th century were multi-ethnic and multi-lingual with NO direct continuity to ANY modern country, and that ALL modern nations are just that – new & modern – then it readily becomes apparent that no one “owns” any history. So the actions of Greece and Bulgaria who clim that Macedonia is ‘stealing’ their history are like those of a spoilt child , bullying a smaller neighbouring nation which really is of no threat to their existence , or history. I am sorry to say I never expected to meet so many wrong placements through a posting! Because all the reports, censuses etc some 100 years ago state these people as Greeks or Bulgarians. No Macedonian Ethnicity is detected at any case. Ancient Macedonians were Greeks. Pls see the next posting just below. Actualy it’s just the Macedonians themselves who claim they are Greeks; not the Greek state. Additionally there is no “Aegean Macedonia”. Most of the original Macedonia belongs to Greece now with a small Part of it (Pelagonia) that belongs to FYROM. After the terror methods exercised by the Tito regime through all the past decades, they also have dual personalities too! As to Dimitri’s comment;Dimitri,you are a fool to begin with. Tell the readers on this site,why is Greece claiming the Macedonians are Bulgarians and our ancestors as Greek. Greece claims the Macedonians in the occupied Aegean Macedonia are Greeks. Additionally there is no “Aegean Macedonia”. Most of the original Macedonia belongs to Greece now with a small Part of it (Pelagonia) to belong to FYROM. Both Greece and Bulgaria claim the Macedonians are one of them.How can anyone in his/her right mind think ethnic Macedonians are with dual identity. As for Dimitis claim on Alexander,read up on Isocrates letter to Philip,also Demosthenes epitaph for the fallen Hellens at Chaeronea in 338 bc. Both Isocrates and Demosthenes express personal views to the matter. Further to this, Demosthenes was a fanatic enemy of the Macedonians so his statements are guided by his hate and hate is not an objective adviser. Regarding Isocrartes, he had been asking Philip to lead Greeks against the Barbarians (Persians). Prior to this he had addressed for this proposal to other leaders and all of them were Greeks. It is naive to judge Isocrates by cutting off a sole statement from the rest of his remarkable writings that show that Isocrates was interested for the total of Greeks and wanted a United Greece against the common acceptable belief of the time that favoured the case of the City-State. Again it is naive to think after the above, that Isocrates would enjoy to see some Barbarians to lead Greeks against other Barbarians. 1)	All of the thousands of inscriptions dated before the Roman occupation, found in Macedonia are ALL in Greek. There is not even a single inscription found in Macedonia, which was not in Greek. 2)	The vast majority of their names (of men and women) are Greek names. Those few that cannot be identified as Greek, cannot be identified as non-Greek either. (Nobody can say that they are of Illyrian or Dardanian or whatever the origin). 3)	They shared the same religion with the rest of the Greeks. 4)	Their traditions and their cultural aspects (e.g. the names of their months) were Greek. 5)	They participated in the ancient Olympic Games. Everybody knows that only Greeks could participate in the ancient Olympics at that time. That means that they considered themselves as Greeks and also that the rest of the Greeks considered them as Greeks too. 6)	Their language was Greek too. The Pella Curse and the Aiani inscriptions triumphantly prove it. As even simple people were speaking Greek well before 400 BC it is impossible that they had been linguistically Hellinized. All of the above show the ancient Macedonians Greek identity and count much more than Demosthenes, Isocrates etc opinions about the Macedonians. As for Athens and Sparta,they hated each other.They did not consider themselves as same people. Like all of the above this is wrong too! “For there are many great reasons why we should not do this, even if we so desired; first and foremost, the burning and destruction of the adornments and temples of our gods, whom we are constrained to avenge to the utmost rather than make pacts with the perpetrator of these things, and next the kinship of all Greeks in blood and speech, and the shrines of gods and the sacrifices that we have in common, and the likeness of our way of life, to all of which it would not befit the Athenians to be false”. As you see the Greeks considered as people of their Nation those who had in common all of the above aspects “which are the same for all” (of them), and not only the religion. Nothing more wrong than this. King Otto and his Bavarians never wrote any History of Greece. The Greek history had been written the centuries ago by countless scholars of any nationality and – unlike yours – it is not fabricated but based on facts only. According to Skoulariki the Greek governments are not convincing because it is a fundamental right of all people to freely choose their name. Is it a fundamental right of all people to freely choose their name, even if this is a name that belongs to others? Give me a break! So far to my knowledge this is plain fraudulent impersonation and is prosecuted all over the world and by no means a “fundamental right”. Empires (but States not so much or you could give an example) of the past century, like the Ottoman or the Austro-Hungary Empires, were multi ethnic and this was the main reason of their disintegration. Even now the remnants of these Empires (like Czechoslovakia) were split according to their national compositions; Yugoslavia too! This means that this is not correct and that all these peoples had their own National histories which identify them and respond exclusively to these related people only; eg during WW2 the Slovakians were allies to the Axis forces while Czechs were enemies; so you cannot mix the histories of these two Nations, nor one would ever claim the History of the other. On the other hand even when people of various nationalities were put together under a central administration (Ottoman) they also had their own national character, objectives and reactions. For example Filiki Eteria was activated and addressed to Greeks only during the late Ottoman period despite the fact that both Serbs and Bulgarians were also Orthdox Christians who lived under the Ottomans. I humbly think that Greece and Bulgaria, like any other real Nation, have the right to defend their respective histories against any forgery and usurpation. @Dimitri;With all due respect,your several comments are wrong,and here is why;The census during the Ottoman Empire were based strictly on religion,not on ethnicity,that is a fact.Greeces 1920 census was conducted in the same manner,here is a short transelation from Greek to English written on December 19th,1920 under the tittle”E makedoniki glossa stin apographi plithismou tou 1920″the article was written by Dimitri Lithozou.”Ti 19th Dekemvriou 1920 pragmatopiithike i geneki apographi tou plithismou tou ellinikou kratous ke ton ellinon ipikoon pou vriskotan stin allodapy.E apography avti itan i proti pliris katagraphy ton katikon ton neon eparhio tou ellinikou vasiliou(ke ton idietoron haraktiristikon tous) kathos i”Aparithmisis ton katikon ton neo eparhion tis Ellados”pou diexihni apo ton elliniko strato to Septemvrio tou 1913 parihe mono plirofories gia ton arithmo ton katikon ana ikismo ke diakrisi kata filo.To apographiko deltio to opio hrisimopiithike perielamvane erotimata gia to onoma,to eponimo, tin ilikia,ton topo geniseos,tin ipikootita,ti dimotikotita,tin ikogeniaki katastasi,tin ekpedephsi,to epagelma i tin pithani anergia,haraktirismo ton tiflon ke ton kophalalon ke plirofories gia ta meli ton ikogenion pou ihan metanastephsi sto exoteriko.Episis iparhan idieteres erotisis gia ti thriskia ke tin glossa ton apographenton.”I will not try to translate the whole page.As you can see,the census was done in the same manner as during the Ottoman Empire,no ethnicity mentioned.In the matter of ancient artifacts read my next comment. Regarding Lithoxoou, the only thing he performs well is to translate into Greek the FYROM propaganda. The fact that the subject of this (also known to me) article reflects only to the language (that is called “Macedonian”), does not justify any claim that the people who spoke “Macedonian” were not Greeks. Even the last of the linguists knows well that “the language alone is not enough to provide a solid proof about someone’s national identity”, eg speaking English does not mean that I am an Englishman. Yet, wherever there is a refer by the Greek authorities to the language or to people as being “Macedonian” this is done just because the Greek authorities of that period did not want to use the name Bulgarian, just because the Bulgarians were enemies at that time and thus they didn’t want to present these people as speaking Bulgarian. So Lithoxoou’s rubbish does not make any sense or evidence about anything. Regarding the Hilmi Pasha Turkish census of 1906 for the region of Macedonia, it states separately the Christian Orthodox populations as Greeks, Bulgarians, Serbs and others (eg Vlachs after the insistence of Romania). is wrong as opposed by the proofs. Unfortunately no Macedonian population is stated at all through these censuses. This means that not even a single person ever identified himself as an “ethnic Macedonian”. @Dimitri:Dimitri,here is professor Mario Alinei,Dean Emiritus of the University of Utrecht,director of several linguistic reviews and progenitor of the Continuity Theory,states,”I have to commence by clearing away one of the most absurd consequences of the traditional chronology namely that of the arrival of the Slavs into the immense area in which they now live.The only logical conclusion can be that the southern branch of the Slavs is the oldest and that from it developed the Slavic Western and Eastern branches…Today only a minority of experts support the theory of a late migration of the Slavs.Recent genetic studies conducted by Oxford University reveal that todays ethnic Macedonians carry only 15,2% of the Slav gene,slightly above modern Greeks and Albanians and less than Serbs and Bulgarians! They further reveal that todays ethnic Macedonians have the highest amount of the Mediterranean gene of all European people!This was also confirmed by the University of Madrid studies.In a court of law,it is genetic proof that is conclusive,I might add!Here is a suggestion for the Greeks,how about DNA tests on the remains of the Royal Macedonian Tombs,uncovered and desecrated by Greeks in todays occupied Macedonia?.Follow this up with genetic tests on modern Greek and Macedonian population…we will soon see the truth!.Further,there is no pure Slav people…just like there is no pure Greek. In summation…Ethnic,yes todays Ethnic Macedonians cannot possibly be of the old Mediterean substratum if they were slavs arriving in the Balkans in 6th century as the 19th century Western constuct asserts!Todaysethnic Macedonians are authocthonous to Macedonia,it is very simple! Their language,unintelligable to the ancient Greeks,was a form of proto Macedonian/slav,which they spread outward,becoming more complex as it moved further away from Macedonia.Countless proto Macedonian letters unearthed on the territory of the Republic of Macedonia,and no doubt in Pirin and Aegean Macedonia,though the respective occupiers have no doubt concealed them from the world because it does not fit their lies,attest to this fact”. You see Dimitri,Macedonia is not Greece nor Bulgaria,it is simply Macedonia different than our neighbors.Have a nice day! Dimitry,you are so right on the language issue,I tip my hat to you.But,the problem is,why do you argue,if Alexander spoke Greek,it means he was Greek?.I have been arguing this point for a long time.Alexander spoke both Greek and Macedonian.The evidence is during the trial of Philotas in Asia.Also,the Greeks and Bulgarians are saying that we speak Bulgarian,which is a bunch of bull,don’t you agree?The Macedonian language is different from Bulgarian.Yes,there are similarity,but also the Macedonian language is similar to the Russian,Ukrainian,Polish,which it means,all Slavic languages are one way or other similar.Take for instance the English language,or even different US states,they all have differences in pronouncing words.Pollybius thesis also makes difference.I speak four languages,understand seven of them.On the issue of Dimitri Lithozou,he is talking about 1920,not 1990 or 2012 in support of the Republic of Macedonia.Let me say one thing,when one is in prison,does not have the resources to write his/her life story.The only time they can write is when they are free,and this goes for the Macedonian people.They are free,therefore,they can write their own history!Dimitri,have a nice day! Fule is incredibly evasive. Why does he pretend not to notice FYROM’s government’s absurd attempts to usurp history of Bulgarians and Greeks (and dare I say even Albanian mother Teresa has been redubbed a “Macedonian”? This peace at any costs mentality towards FYROM stinks of Chamberlains behavior. Fule “generously’ gives away other people’s identities. Have to wonder if he would have supported a neighbouring state to Czech republic that decided to rename themselves “ethnic Bohemians”…claimed Czech historical figures as their own….and had large numbers of citizens that used that fake history to frame his homeland as “Czech occupied Bohemia”. To say only that the Paleolithic Continuity Theory enjoys very little academic support so you’d better keep some reservations about it. Ok, PLEASE do not mix national aspirations and DNA as this ends to racism. Skopje University research that proves that modern Greeks have close kinship with the modern inhabitants of FYROM. You may choose any out the above three options I REALLY DON’T CARE! DNA analysis is a very complicated procedure and very expensive too and bear in mind that this just for one individual. DNA analysis of a population group requires some thousands of individuals to be checked thoroughly (which requires lots of money) so to come close to a trustworthy result. I guess that you understand what the above imply; that DNA ethnic analyses are plain rubbish and used mostly for propaganda reasons so you’d better keep some reservations about it too. Here is a suggestion for the Greeks,how about DNA tests on the remains of the Royal Macedonian Tombs,uncovered and desecrated by Greeks in todays occupied Macedonia? Don’t judge from FYROM’s shameful methods dear Peter! The findings in Greece are accessible to anybody, unlike in the case of the findings in FYROM as access in them would reveal their Greek character. Macedonia was occupied By Turks and today is liberated and the Greeks of Macedonia are glad about this. On the contrary the prosecutions by the FYROM authorities, through all these decades and up to now, against many thousands of people who had the unfortunate idea to declare their Bulgarian identity, show clearly where the occupied territory lies. Further,there is no pure Slav people…just like there is no pure Greek. I agree. Intermixtures are common to all Nations. Their language,unintelligable to the ancient Greeks,was a form of proto Macedonian/slav,which they spread outward,becoming more complex as it moved further away from Macedonia. I am sorry to say that you are lacking evidence dear Peter or please do present the proofs. “Their language was Greek too. The Pella Curse and the Aiani inscriptions triumphantly prove it. As even simple people were speaking Greek well before 400 BC it is impossible that they had been linguistically Hellinized”. I present two proofs that ancient Macedonians wrote and spoke Greek: The Pella Curse and the Aiani inscriptions. So where is the evidence that their language “was a form of proto Macedonian/slav”? Further, by being unintelligible in speech one does not mean that he/she is talking a different language; Pontians, Cretans, Cypriots etc speak unintelligible to the other Greeks, however they do speak Greek dialects. To note also that there is no evidence that ancient Macedonians spoke an unintelligible language to the other Greeks or please do bring your proofs for this. Countless proto Macedonian letters unearthed on the territory of the Republic of Macedonia,and no doubt in Pirin and Aegean Macedonia,though the respective occupiers have no doubt concealed them from the world because it does not fit their lies,attest to this fact”. I have already answered: the shameful forgery methods are part of FYROM’s habits; not Greece’s. Regarding the “Countless proto Macedonian letters unearthed…” why the FYROM authorities do not present them to any International Archaeological Congress? Should I say again “because of the fear that these shall reveal their Greek character”? You are probably referring to Mauro Orbini a Croatian Catholic who was fond of the pan-Slavic ideology of Vinko Pribojevic to which he contributed further. His writings however are totally out of value as they are not based on any proofs or evidence but mostly in his desires so you’d better keep serious reservations about it too. I guess that out of FYROM nobody pays any attention to his writings. Who is John Adams? What is his profession and what was his knowledge about ancient and contemporary Macedonia, Greece and Illyria? But,the problem is,why do you argue,if Alexander spoke Greek,it means he was Greek? Not just because he spoke Greek but because as a Macedonian he was a Greek. The evidence is during the trial of Philotas in Asia. This is what I thought you were talking about. The Philotas case does not give any evidence that Macedonians were unintelligible to the other Greeks. Also I am talking about that period too and provide (hope adequate justification why the Greek authorities of 1920s named the language “Macedonian” and not “Bulgarian”. The only time they can write is when they are free,and this goes for the Macedonian people.They are free,therefore,they can write their own history! Actually for all the past decades the people in Socialist Republic of Macedonia were imprisoned under Tito’s dictatorship and were forced to accept what they were told. Now they come to life and have to face a different reality. Hope that they will get real life soon! Your ancient historical claims are absurd. You essentially have nothing to do with ancient Macedonians. You can’t even tell modern history accurately much less ancient. Why do you hide FYROM’s mostly ethnic Bulgarian past? Why do you hide your so-called “Macedonian” language.. used to be called Bulgarian prior to communist modification? Peter is a FYROM ultra nationalist that evasively pretends not to know of FYROM’s past life as non “ethnic macedonians”. This is precisely why he hides information like this. Dear all, whoever whatever anyone may be, he/she may freely post his/her view to any relative matter through this forum, provided that shows respect to the other posters/readers. Peter, apart from some high nationalistic tones, is kind and has posted some interesting postings so far, that show the certain way the ordinary people in FYROM face the history differs and overall aproach to neighbouring issues. I wish you all the best in your country there! @m_dzakova I guess in the beginning there was Macedonia.. and nothing else? If Macedonians dislike Bulgarians that much, then why are there big queues of Macedonians waiting for a Bulgarian citizenship? They all want to be part of the EU. How come Macedonians can spit on another country’s culture, steal its history and language, and still expect to be treated with respect? And it is about time someone takes action against this! After all, can a country be really proud of its own history, if it’s not their own in the first place? One more question to all Macedonians here: We know about Alexander The Great, Tsar Samuel, Cleopatra.. but.. was Jesus also Macedonian?? @Stella,Macedonians are taking Bulgarian passports for free travel to other EU nations.Traveling with Macedonian passports it allows them only three months,with Bulgarian they can stay forever if they want to.That is the sole reason,not because their conciseness is Bulgarian.Jesus was a Jew my dear,lets not bring religion into this.Macedonia does not steal your history.Our history goes more than 4 thousand years,before you Tatars showed up in this area from “Volga,Bahtria or as per B.Dimitrov Persia lately.This is the father of the Bulgarian history LOL. TO ANSWER THE QUESTION THAT STELLA IS ASKING WHETHER OR NOT JESUS IS OLSO MACEDONIAN I WILL SAY DEFINETLY HI WAS GREEK FOR SURE AND NOT A JEW HA HA. THE PROBLEM IS NOT THE REPUBLIC OF MACEDONIA BUT, US THE MACEDONIANS LIVING UNDER GREEK AND BULGARIAN OCCUPATION IN OUR OWN COUNTRY MACEDONIA. It was Tito who recognized the Macedonians who contributed to the fight againts the Nazi occupation.The fact is,the Macedonians in occupied Aegean Macedonia fought on the side of EAM againts the occupying Nazis and Italians.The Prime Minister Gruevski’s grandfather fought and died fighting on the side of Greece in the “Albanian War”when Italy attacked Greece.Even today,there is a plaque in his native village with his name on.In 1945 after the War,Greek pro Nazi government promised free elections,instead they started to imprison officers of EAM instead of elections.In 1946 the DAG was formed to fight the pro-Nazi government.This was called”The emphilio polemo”.Both EAM and DAG promised the Macedonian masses in the occupied Aegean Macedonia to join their fight againts Athens government supported by the Brits.They were promised their freedom.We now experiencing the same fait as in 1936-1940 during the Metaxa dictatorship.Metaxas ordered all toponims,peoples names to be changed to sound Greek.During his reign,there were villages burned down,people imprisoned and sent to Makroniso and other islands just because they declared their ethnicity Macedonian.Let me go back to 1946-50 when the KKE made promises to the Macedonian people of their Human Rights dignity,their freedom of schools for the Macedonian children in their own language.Equal rights with all citizens of the nation.Zahariadis and Markos destroyed the Macedonian people.In 1948 they gathered all children from ages 0 to 14 and shipped them to the socialist countries.This eliminated a whole generation of Macedonians in occupied Aegean Macedonia. Villages became ghost towns.Former Greek Prime Minister Mitsotakis was partialy right in 1995 saying”we thought all the Macedonians left the country in 1950 after the “emphilio polemo”.Now,compare Greeces stance toward the Macedonians and the Tito stance in Yugoslavija.Macedonians fought alongside Tito,they were recognized,and in 1944 ASNOM declared independence of the Yugoslav Federated Socialist Republic of Macedonia.This is how the Republic of Macedonia became wholly independent nation in 1990.As for Bulgaria,they fought on the side of the Nazis,their IMRO was fighting againts the Macedonians.They want to celebrate our heroes together.Will they celebrate the Macedonian hero Yane Sandanski who was killed by the Bulgarians in 1915?. The Prime Minister Gruevski’s grandfather fought and died fighting on the side of Greece in the “Albanian War”when Italy attacked Greece. Yes, his grandfather was a Greek hero. His name Gruev was changed (possibly by the Greek authorities) to Gruios. The name was changed once again by FYROM authorities upon their arrival there after the Greek Civil war and is the name he is bearing now: Gruevski. In 1946 the DAG was formed to fight the pro-Nazi government.This was called”The emphilio polemo”. And who were the democrats? The Communists? That’s a bad joke Peter! … Let me go back to 1946-50 when the KKE made promises to the Macedonian people of their Human Rights dignity,their freedom of schools for the Macedonian children in their own language.Equal rights with all citizens of the nation. Actually the Greek Communists stated that the Greek area of Macedonia should become independent and join with the Socialist Republic of Macedonia (SRM) within the Yugoslavian Federation. This statement took place after the demands of the Comintern that was guided by Moscow. Greek Communist = the other word for traitor! Yet despite the promises the Greek Slavophones were unwilling to fight with the Communists against the Nationalists but in most cases they were forced – men and women – to join the Communist side. After the end of the Civil War there was no way out for these tragic people and in most cases they had to follow the Communists in exile. Metaxas ordered all toponims,peoples names to be changed to sound Greek. This was a policy from the years of King Otto, where the Bavarian administration decided to rename most places in Greece and give them their ancient names. Metaxas continued this policy. Even now, although a bit outmoded, the renaming to the ancient names still exists. In 1948 they gathered all children from ages 0 to 14 and shipped them to the socialist countries. That was a big crime against Greece. The majority of these 28.000 children were relocated from the East Communist countries where they had been settled, first into Yugoslavia and in turn they were sent to SRM, where they were brainwashed systematically to become “proper Macedonians”. Some of the most fanatic “Macedonians” today come from these kidnapped children. Former Greek Prime Minister Mitsotakis was partialy right in 1995 saying”we thought all the Macedonians left the country in 1950 after the “emphilio polemo”. So far to my knowledge I don’t know any statement like the above ever made by the former PM. Is it possible to advise details about this? (date – place – original source). To be honest I don’t think he ever made such a statement. IMRO in the Greek area of Macedonia was made up by local pre-Bulgarian elements. After they realized that the war was lost for the Axis powers they turned en masse to the support of Tito’s forces in the area. Will they celebrate the Macedonian hero Yane Sandanski who was killed by the Bulgarians in 1915?. Sandanski became victim of the controversy between Centralists and Federalists, who were both Bulgarians. Anyway a Bulgarian would be more suitable to deal with the matter than a Greek like me. Now,compare Greeces stance toward the Macedonians and the Tito stance in Yugoslavija.Macedonians fought alongside Tito,they were recognized,and in 1944 ASNOM declared independence of the Yugoslav Federated Socialist Republic of Macedonia.This is how the Republic of Macedonia became wholly independent nation in 1990. “Under the influence of its “Macedonian” Revolutionary Organization, many pre-Bulgarian organizations emerged. One trial followed another in Yugoslav Macedonia. From 1944 to 1980, seven hundred political trials conducted against intellectuals. Hundreds of death sentences were executed and 23,000 people disappeared and are considered to be murdered. Others were imprisoned and 120,000 were sent to concentration camps. Some 180,000 emigrated to Bulgaria, the USA and other countries. All this happened within the boundaries of a region whose population was only around 2,000,000 in 1990”. The divided Macedonia is just a FYROM propaganda myth. Most of the original Macedonia lies in Greece (some 90%). The rest (Pelagonia), lies in FYROM and a minor part in Bulgaria. Macedonia has not been divided, unless you are talking about the approx. 10% out of the total of the original Macedonian area (that is Pelagonia) and is out of Greece. The rest 90% of FYROM has nothing to do with the original Macedonia. Greece, for long ago, has neither territorial claims nor any other demands against any neighbouring countries. Greece’s only relative concern is only for the people who live in neighbouring countries and identify themselves as Greeks so to have their fundamental human rights that any individual may have on this earth and that’s it. If we keep on with the claims, then rivalries and controversies shall never end and shall result to all relative unpleasant consequences! We don’t live in 1913! Or what is the profit for FYROM due to the claims they retain? A lost decade out of EU I guess! The truth is that you have to wake up from the FYROM propaganda lullabies and come to modern world! All Europe has abandoned claims against neighbouring countries and walk together through cooperation and mutual understanding. Please get some synchronization! WHY GREECE IS ACCUSING THE REPUBLIC OF MACEDONIA OF IREDENTISM? Because of your posting that justifies completely the Greek concerns. THE PROBLEM IS NOT THE REPUBLIC OF MACEDONIA BUT, US THE MACEDONIANS LIVING UNDER GREEK AND BULGARIAN OCCUPATION IN OUR OWN COUNTRY MACEDONIA . THIS IS NOT YOUR COUNTRY BUT JUST LEGAL TERRITORIAL PARTS OF GREECE AND OF BULGARIA RESPECTIVELY! GET USED TO IT AND BE RESPECTFUL TO YOUR NEIGHBOURS IF YOU WANT TO RECEIVE EQUAL RESPECT IN COMPENSATION! Now what I know (at least in Greece), is that those who claim themselves as “Macedonians” have their own political party and enter freely in the Greek elections, only to collect the ridiculous amount of some 2.000 votes only, out of the two million people living in Macedonia. On the contrary, in FYROM you forbid Greeks or Bulgarians to reveal their national identities or even to speak in their mother tongues. So the problem lies in your country (FYROM) and not in Greece (or in Bulgaria). As a Greek, I should speak just for my country, so there is no occupied territory in Greece and the people are free to express their identities. The occupied territories lie where people are afraid to speak and this happens in FYROM! Outside to official Athens however,there are some Greek intelectuals who have entirely different views on the name dispute.Athena Skoulariki a sociology professor at the University of Crete,for example says that”Greece is tangled in a strategic dead end.In the course of the last 16 years we have lost one battle after another and still have not seriously considered what we are doing wrong. Why is the outside World not supporting the Greek thesis on this issue?Why after so many years of trying has Greece not succeeded in convincing the international public?”asks professor Skoulariki.According to Skoulariki”the Greek arguments are not convincing because it is a fundamental right of all people to freely choose their name.We insist that our neighbor has no right to use the name Macedonia,ignoring the fact that during the 19th and 20th century there was a wider region called Macedonia:.Anastasia Karakasidou 300 page book study of ethnicity and identity in the Northern Greek province of Macedonia has been put on the back burner by Cambridge University Press due to a Greek protest.What was Greece afraid of this book?. In Greece there is no free speach,nor free elections.Here is why.Two years ago during European election in Greece,the Macedonian Party attempted to mail election material.The thing is,after the elections the Post Office which is a government institution called the Ouranio Toxo to go to the Post Office and pick up their election material which was post paid but refused delivery.Now thats Greek democracy,and on top of it,Greeks argue that the Macedonians are not getting the votes!Last year,a bishop from Salonika organized a demonstration and with it threatened to destroy newly opened Radio Station in Ovcharani(Melitis)in the Macedonian language.These people are paying taxes to the government,and through taxes church people are being paid wages.Now,since the people received license to operate a Radio Station,why is the church getting involved? I think,I gave you enough to think about Dimitri.I can speak about Greece,I was born there,I remember a lot.Iremember how the “pospasma”was working,what kind atrocities they were doing in the Macedonian Villages.I hope I answered your questions. Dimitri,IMRO never fought on the side of the Macedonians.Furtheremore,during the Nazi occupation there was no Macedonian government as we were under occupation,therefore,it is wrong to assume,that the Macedonians sent people to the concentration camps.As you know,the parts of Macedonia were under Bulgarian occupation,same as parts that were under Greek occupation,these two governments were sending people to the concentration camps.Please,lets keep fact as they are factual.I must tell you,I take offence on lies,and that is why I do my best not to mislead anyone,because lies are very hard to defend.Recently,Bulgaria boasted how they saved the Bulgarian Jews while sending thousands of them from the Macedonian territories to the concentration camps in Treblinka and other camps.The Federation of American Jews said it right”a murder is a murder”to the Bulgarian government.Have a good day! The name is Theodore Skylakakis and not T.Skinalis and he is a politician. Mitsotakis made the statement – according to him – under the pressure from various International Organizations that could start the procedures for the creation of a Slavic minority in Greece. As I told the collection of 2.000 votes for the party of the “ethnic Macedonians” out of 2.000.000 voters is just a ridiculous result that cannot put any serious base on claim about an oppressed “multitudinous” “Macedonian” minority. Further to this, you have to be careful prior to speaking about any “Macedonian” minority abroad and check in your own country and the situation of the minorities living there like the Greek or the Bulgarian ones that are deprived by any of their fundamental human rights so far. Regarding Athena Skoulariki I have been placed already and I don’t think it wise to repeat the same thing all the time. The excuses of the Ouranio Toxo – Vinozito to justify their total failure through all the elections they took part, regarding the post offices etc, are childish the less. An. Karakasidou gives her personal view to the matter in many cases without evidence. Her personal view is accepted by herself and those who benefit from this. To me it’s simply out of value. The bishop who made this statement is Anthimos of Salonica and his statement is of no specific gravity – nothing happened! I never said that IMRO fought on the side of Tito’s forces in the area. What I said was that the people in IMRO changed side as soon as the saw that the war was lost and joined with Tito’s forces of the area. Regarding the Greek government of the Nazi occupation period they never sent anybody to any concentration camp. This task in Greece was performed solely by the Nazi forces and some Greek individuals but by no means by the puppet government or any of their services. Excus me Dimitri,I am from occupied Aegean Macedonia,I am not from the Republic of Macedonia,furthere,I never lived in Macedonia.The reason I support the Republic of Macedonia is because this is the only part of geographic Macedonia FREE!The Macedonians are their own masters in their own house.Once a Greek commented”the Macedonians came to our living room and claim it is theirs.How ironic,Macedonians did not come in Athens to claim his living room as ours.It is the Greeks who came to our living room in 1913 and claim that our living room is theirs.It looks like you don’t like to comment on the Metaxas dictatura from 1936-40.I don’t blame you,there is no defense for what he did to the Macedonian people.On the IMRO subject,they never joined Tito,they remained Bulgarian.Today at the EU parliament their remnants are members of that organization who think,they should fought Greece for the Macedonian teritory.The governments ofGreece and Bulgaria,within whose state borders live great numbers of Macedonians are not only carrying out systematic denationalization of those Macedonian national minorities residing in northern Greek territory,the Aegean portion of Macedonia and in the South-West portion of Bulgaria,the Pirin portion of Macedonia but,in order to justify that procedure,negate the existence of a Macedonian nation altogether that is the Republic of Macedonia.It is maintained that they are”Slavicized”Greeks or “Macedonianized Bulgarians”not a separate people who with the penetration of Greeks and Bulgarians onto Macedonian soil constituted itself a separate nation in the Balkans during the last century,particularly the second half of it.Then occurred the fateful moment,the declaration of Macedonian natinality which is,as E.Kardelj states,”the most convincing and trustworthy sign of the existence of any nation,the Macedonian included”. (E.Kardelj,The Development of the Slovenian National Question. )On the elections,you are wrong.When people don’t know who’s running,they don’t cast a vote.When people don’t know their platform of a party they don’t vote for these candidates.But the fact is,a government institution barred the delivery of election material.If this happens in the USA the Supreme Court would have been involved,and heads would have been rolling the likes of long term jails regardless of rank.Dimitri,as usual,have a great day my friend! Most of the people who live in south Fyrom are of Greek origin. If you come from the original area of Macedonia then you are probably of Greek origin. Also I come from a city in Bulgaria once called Philipoupoli and now Plovdiv. So what? Should I say that the area of Philipoupoli/Plovdiv is “occupied” by the Bulgarians? I am sorry my friend but this is insane and leads to a vicious cycle of territorial claims that not only never end but cause always dangerous situations. You come from a place of North Greece – so what? I come from a place of South Bulgaria – so what? Other Greeks come from Turkey – so what? Some Bulgarians come from other areas of north Greece too – so what? THE GAME IS OVER MY FRIEND! THERE ARE NO “OCCUPIED” TERRITORIES WITHIN EUROPE! PLEASE GET USED TO IT OR YOU SHALL BE ALWAYS VETOED! I am not from the Republic of Macedonia,furthere,I never lived in Macedonia.The reason I support the Republic of Macedonia is because this is the only part of geographic Macedonia FREE!The Macedonians are their own masters in their own house. Correct! The Macedonians are masters in their own houses after they were liberated by the Greek army since 1912-13. Once a Greek commented”the Macedonians came to our living room and claim it is theirs.How ironic,Macedonians did not come in Athens to claim his living room as ours. It is the Greeks who came to our living room in 1913 and claim that our living room is theirs. No, the Greeks liberated areas that were Greek since ever. The fact that you talk about “occupied” territories that were “divided” is a clear proof on how Tito used propaganda and history distortion to give cover to his territorial ambitions against adjacent areas of the neighbouring countries. I am sorry to say this is pure chauvinistic fanaticism. The more you do not understand what the reality is the more isolated you shall be as a country. Greece never came to anybody’s living room. Any fascist regime that retains claims against others has to convince its people first that they have the right to claim their neighbours’ areas. This can be achieved with the manipulation of the common public and the hard oppression of those who may have a different opinion. The 23.000 missing people however, (actually murdered), out of a population of less than 2.000.000 for the past decades, just because they declared themselves to be Bulgarians, is the indisputable proof of the shameful Titoic oppressive methods. To note only that Greece of the same period with a population of 8.000.000 never reached such an amount of political murders. (23.000). In 1912-13 the Greeks of Macedonia were happy to see their places being liberated by the Greeks Army but the same event brought grief to the Turkish and Bulgarian populations. The opposite happened in the areas liberated by the Bulgarian (or the Serbian) Army; the Greeks were unhappy to see their areas liberated by the Bulgarian or the Serbian armies! Actually not even a single person ever protested at that times that: “he was “Macedonian” and the Greeks (or the Bulgarians entered his “living room”! Greeks protested against the Bulgarian annexation of their areas and the Bulgarians protested against the Greek annexation of their areas too but NOBODY ever protested as a “Macedonia” – so relax; nobody ever entered your living room! It looks like you don’t like to comment on the Metaxas dictatura from 1936-40. I don’t blame you,there is no defense for what he did to the Macedonian people. All Greeks suffered the same under this regime. Non-Greek-speaking Greeks suffered further because they were not allowed to speak their languages. Not only the Slavophones but also the Arvanites, the Vlachs or the Turkish-speaking Greeks were forced not to speak their mother tongues – so don’t try to play the role of the sole victim; what happened in your areas was the same that happened all over the Greece but your propaganda has managed to convince you that you were the only target – that’s a silliness! On the contrary the FYROM authorities continue the fascist methods of the Tito oppressive regime to convince people that they are not Greeks or Bulgarians but … Macedonians! They are Slavophones and not “Slavicized” and they are more Greeks than I am. It is them mainly who fought in 1904-1908 for Macedonia to remain Greek. Then occurred the fateful moment,the declaration of Macedonian natinality which is,as E.Kardelj states,”the most convincing and trustworthy sign of the existence of any nation,the Macedonian included”. I don’t know Kardelj but if so, this guy must be a very naive person! On the elections,you are wrong.When people don’t know who’s running,they don’t cast a vote.When people don’t know their platform of a party they don’t vote for these candidates.But the fact is,a government institution barred the delivery of election material. Whenever they participated in the Greek elections, they were given proportional time in the Greek television and their participation was announced through all newspapers according to the law. Also their party and candidates were announced to all the election poll of the areas they participated so everyone having eyes, ears and brain could realize the party’s political character and participation in the elections. Those lacking eyes, ears and brains were probably the “Macedonians”! I am sorry my friend but it’s ridiculous the less for these people to blame the Greek Post Offices for their total failure! If this happens in the USA the Supreme Court would have been involved, and heads would have been rolling the likes of long term jails regardless of rank. Also if a US like Supreme Court would have involved in FYROM, then it would have found lots of improper treatment for other parties of Albanian or Bulgarian orientation and the strong oppression of the Greek minority. Too bad for the forgers of history known as FYROM. Do they think they can continue to steal the history and heritage of Bulgaria and Greece and get away with it? Their behaviour has consequences as we have seen with the numerous vetoes of EU and NATO aspirations. Time to stop making up fairy tales and either change their name to something less offensive or join with Bulgaria proper. under the tittle;”Helenic Republic top Secret,Ministry of Public Security,National Security Services,Athens,16th February,1982.Number of protocol 650217-30427.Since you are in Athens,I am sure you can obtain this information instead I writeing it on this site.But,if you cannot,I would be more than glad to printed for you.The question is,why the Greek government went through these instructions for the police againts the Macedonian population in occupied Macedonia?.Why the Greek government never issued such special police in Peloponisos,Crete or elsewhere in Greece proper?. The reason I am raising the question on Macedonia is,I am Macedonian from the Aegean part of Macedonia.I resent you and your Greek simpatriots calling me”Vulgaros”and from the other side when it suits you you are calling me”Greek”.I am part of that Macedonian minority in the occupied Aegean Macedonia.This is why asked the question;you claim we are Greeks,the Bulgarians claim we are Bulgarians.Can one distinct people be both?.This is same as claiming Greeks are Hungarians by Hungary,Greeks are Germans by Germany,don’t you agree at least to the truth?.Dimitri,I am not giving you examples what the Republic of Macedonia is saying,I am giving you what the Greek government is saying.There is no bias in this,the only thing is,I disagree with the Greek thesis on the question of Macedonia and the Macedonian people,as much as I disagree with the Bulgarian thesis. Dimitri,I did learn the Greek history from start of historical data to 1955.I am fortunate to have Greek teachers who were teaching strictly history and language,not mixing history with politics.I also had the opportunity to learn the Macedonian history and language in the same environment,also two more other languages in my school years. As for politics,you are smart enough to understan,the politicians are looking for something that will excite the public to elect them,even if they lie through their teeth.Look where Greece is today,Samaras robbed the banks in 1995 for political reasons with no accountability to the country,now I hear Venizelos and another 2000 never paid taxes as most Greek citizens are required to do so.The Balkan history is written by each country to suit their aims,not because it is true history.Have you ever hear a murderer admit to it?.Here we are,arguing over the politicians screwed up politics.You were talking about Greeks in the Republic of Macedonia.They are Aegean Macedonians who are not allowed to return to their birth places because the political elite in Greece claim they are all communists.The children refugee of 1948 are not allowed to return unless they declare themselves Greek,and they are 28,000 of them,count me in as well. Dimitri,you see what John is saying above.This nonsense is going on for no good reason.All people have the right to declare his/her ethnicity as Athena Skoulariki said,and as per Human Rights declaration of the UN. The Greeks who were living in Macedonia were happy to welcome the Greek Army; the Bulgarians not. The opposite happened in areas where the Bulgarian Army managed to enter first; the Bulgarians were happy to welcome them but the Greeks not. The question is, why the Greek government went through these instructions for the police againts the Macedonian population in occupied Macedonia ? Why the Greek government never issued such special police in Peloponisos, Crete or elsewhere in Greece proper? There are no occupied places in Greece. The Macedonians are free and happy Greeks. If you are talking about the 2.000 voters of the Ouranio Toxo these are “wannabe Macedonians”. Those who refuse the Greek identity and heritage of Macedonia are not Macedonians; you cannot be something you deny! Macedonia has been Greek since ever! I don’t know anything about protocol 650217-30427 and all these BUT the answer is that those who live in Macedonia are harassed by the FYROM propaganda and their spies that work against Greece and not the people living in Peloponnese or Crete. So, if this was true, I think it is natural for additional attention to be given to Macedonia. Simple? The people who live in Macedonia are either Bulgarians or Greeks. So you have to be one out of them unless you come from a family with one parent being Bulgarian and the other Greek. Then you are both; a Greek-Bulgarian. Germany , don’t you agree at least to the truth? Not quite. People living in FYROM, where acknowledged always as Greeks or Bulgarians. Tito however, made them all “Macedonians”, through various brutal methods and brainwash propaganda. I have already passed the Bernard Cook’s text which is rather precise. it? Here we are, arguing over the politicians screwed up politics. Did Samaras rob the banks in 1995? The Venizelos case and the rest of the 2.000 people is not exactly just the case you stated. Anyway this is a long story and rather irrelevant to the article and the subject and I don’t think it suits here. 28,000 of them, count me in as well. No, I am not talking just only for the 28.000 children kidnapped and never returned to Greece as they should. These people after so many years of brainwashing propaganda are no longer Greeks but enemies of Greece. Sad but true. The Greek Government was right to allow the Communists, who left after the Civil War, to come back to Greece, as long as they claimed their Greek identity. Those who deny their Greek identity are not Greeks and shall fight again against Greece as they did when they interfered during the Greek Civil war not because they were Greeks but just because they wanted to destabilize Greece further. Besides the above case, I am talking further for the tens of thousands of Greeks who live in FYROM and are still forbidden even to speak in their Greek language. Regarding Skoulariki’s statement, (if this has been transferred properly) I have already replied as per above Peter. Dimitri,we argued on the subject of this article too long,but I can tell you one thing that it is for sure,and that is;Greece and Bulgaria know they are occupying Macedonian land since 1913,and I can tell you for sure,I am ethnic Macedonian,not Greek nor Bulgarian,nor Serbian. “A document from the Greek Secret Service,dating back to 1982,exemplifies the methodical steps Athens took to destroy Macedonian ethnic conscious as well as the “idiom” within its territory.The plan had been drafted on February 16th,1982,by the Chief of the Greek Secret Service,Dimitris Kapelaris. According to the plan,Athens had created a Secret Team nicknamed”Plot Againts Macedonia”that was dispatched to Aegean Macedonia and infiltrated into all aspects of public life:(Tax office,Schools,Army,Church,etc).This is the period when a lot of Macedonians were followed,jailed,fired,beaten,for publicly stating they were Macedonians,not realizing they were being spied on at every level.The GSS also had plans for Florina(Lerin) resodents who failed to “feel Greek”,and feared may succumb under local Macedonian influence.As a solution,the Secret Service proposed to give these people money,brainwashing literature,and creating a cultural organization named “Aristotelis”.A brilliant plan,that ought to make them “Greek”!The magnitude,the sheer stupidity and lunacy of these people is remarkable.Dimitris Kapelaris took a moment to congratulate the Secret Service for managing to”almost”wipe out the Macedonian conscious and the “idiom” in Kastoria(Kostur).The Greek Secret Service despised the fact that Macedonians mary only Macedonians in Greece,and made plans how to mix marriages,so the Macedonians would loose their ethnicity.Were they trying to create more of the Karamanlis type?Their plan backfired,to this day Macedonians in Greece marry Macedonians.1982,the year of this letter,is also the year Athens implemented laws banning Macedonian refugee from returning to their properties-Not a coincidence.Next,I will copy the document drafted by the Secret Service. I am sorry to say dear Peter that this is plain propaganda. This text about the police activity seems to be the only text to advice about this case and it is reproduced through the internet like the case is now. the Secret Service proposed to give these people money,brainwashing literature,and creating a cultural organization named “Aristotelis”. This cultural organization named “Aristotelis” was founded on July 30, 1941 and not in recent years (1980, 1982 or 1984). As it was created in 1941 (at the time of the Nazi occupation of Greece), it’s clear that it was not created by any Greek secret police! The Greek Secret Service despised the fact that Macedonians mary only Macedonians in Greece,and made plans how to mix marriages,so the Macedonians would loose their ethnicity.Were they trying to create more of the Karamanlis type?Their plan backfired,to this day Macedonians in Greece marry Macedonians. That’s totally wrong and a plain propaganda! The Greeks of Macedonia have come into marriages to each other regardless of their origin. The marriages of indigenous Greeks with Greeks from other places (Asia Minor refuges, Vlachs etc) is a well-documented fact that takes place for decades now with a more and more increasing frequency, according to statistics and without any use of force by the Greek authorities of course. You see Peter we were obviously lucky enough to live in a Democratic regime and avoid Communism and its brutal methods of assimilation like the 23.000 people that were murdered in FYROM during the past decades of the Communist regime, just because they claimed they were Bulgarians. As you see Peter the reality is totally different from any FYROM propaganda source like MINA etc. The Macedonian nationalists quite simply stole all of Bulgarian historical argument concerning Macedonia, substituting Macedonian for Bulgarian ethnic tags in the story. Dimitri,in support of that article,here is the rest,weather you believe it or not,it is up to you,but if you do a little research you will see I am right. a)”The Skopians’activities for the autonomy of Macedonia may be efficiently confronted mainly by wiping out the use of the idiom,in the regions near the borders.This opinion is based on the realizations that also other regions that in older times were center of “Macedonianism”,like Kastoria, are not hit by the Skopian propaganda,because there the use of the idiom has been almost wiped out. 2.In the public services and especially in the educational institutions the employees who will be in service have to be ignorant of the local idiom. 5)Establishment of the Cultural Association,like”Aristotelis” in Florina and economic help to them,for the realization of events and the publishing of books,newspapers,magazines,etc.And afterwards these will be sent to the Diaspora abroad who has origins from the regions of the senders.This will boost their national sentiment and they will be protected from the anti-Hellenic propaganda that is been practiced by S/M(Slavomacedonians)organizations. 6.Insertion of various obstacles(non-recognition of diplomas,postponement of military service,etc.) for the Greek students who wish to study in Skopje. 7.Marking in each village of persons who due to their bounds and their personality influence a large circle of co-villagers and with any means(even with money payments)get close to them and use them properly so they will believe as the fighters of the use of the idiom in their circle.To this direction a very positive and effective role can be that of the Younger of the political parties,by the judgement and coordination of the Government,when a between parties agreement will be reached. 8.Recruitment in the Armed Forces,in Police Bodies in the public services and Organizations of employees with origins from Florina region,by exception,and their obligatory location in other areas of the country. 9)The encouragement,by the leadership of the Army of meeting and marriages of Army officers, who are on duty,there and have origins abroad,with women that speak the idiom. THE CHIEF DIMITRIS KAPELARIS ANT/GOS. Dimitri,you my friend can draw the meaning of this.If in doubt,check it out in the Greek archives in Athens before you jump and make an uninformed comment. My friend,Have a great day! Peter, can you advice about the original source of this information? Where did you find this? Can you advice about any relative link? site > category > subjects > etc. Dimitri,you are in Athens,I am sure you can get this information from the Athens archives,the information is numbered and accessible. The information on Samaras raiding the banks in 1995,stashing 130 million dollars in black garbage bags also available from the court documents in Athens. The interview of former PM Rallis for “The New York Times of September 3,1903. Here is a short article on Macedonian Cgief’s death. “A Greek spy betrayed Deltcheffs whereabouts to the Turks,as reported by the London Times-New York Times. London,May 26,-Detailled report of the death of Deltcheff,the famous Macedonian chief,says the Sofia correspondent of The Times,show that he accompanied a band under Voivoda and Kirchovsky,together with the poet Tavoroff,and entered the village of Banitza,near Seres,where his presence was betrayed to the Turks by a Greek spy.A large force surrounded the village, and all the members of the revolutionary band were killed after a long resistance.It is stated that the inhabitants of the village,to which the Turks set fire,were also killed.For both,Rallis and Deltcheff,you can get the information from the archives of”The New York Times”published on May 26,1903.Present Bulgarian State claims Deltcheff was Bulgarian and want to celebrate with Macedonia,is’nt this ironic on the Bulgarians to claim he was a Bulgarian while the reporter of this article was a Bulgarian stating he was Macedonian?.As I said before,a prisoner has no power to defend his/her actions,only when is free! Part of Macedonia is free and able to claim what it belongs to them that was stolen by our neighbors. Dimitri,wish you a great day my friend! London Times-New York Times, Special Cablegram. London, May 11.- The Vienna correspondent of the Times says the death of the Bulgarian revolutionary leader Deltcheff is considered a sever loss to the insurrectionary movement. Hi is said to have been the real chief of the famous organization. Deltcheff arrange the capture of the American missionary Miss Stone, presumably to get funds for the organization. This is from the real cable and I am sure you can see find it on the Internet. MANU must have the originals too. Peter, I said about the 23.000 Bulgarians murdered in FYROM and I stated the source. Since you claim for something you have to state the source dear Peter. Or it’s rather improper to claim for something and tell others “go find it”. Actually I found nothing regarding policeman Kapelaris and his notorious protocol 650217-30427 with his recommendations. Further, if all these are true we have to know whether the Greek Government approved these alleged suggestions. Actually this is the most important of all; anyone may suggest anything but the responsibility belongs to the one who either adopts these suggestions or not. Anyway if these alleged suggestions were applied to the Government I hope they were adopted because the FYROM propaganda to the entire Macedonian area is really unbearable. Oh my God! I hope they did not discard them like rubbish! Peter, that’s really funny! You really made my day! Gotse Delchev was a Bulgarian who fought and died for Bulgaria and that’s all. What is important is that I can support what I say through sources while you do not (or you can’t). Dimitri,I don’t make things up.These documents are in existence.I don’t critisize the Greeks only,I do critisize the Macedonians in the Republic of Macedonia.For instance;Branco Crvenkovski,Georgievski,Frckovski who offered 2 million and a Rolex watch to Gligorov to change the name.Gligorov refused,after that the attempted assassination on his life occur while Frckovski was the interior minister.These people need the same faith as Philotas for being treasonous against their own people. Now than,if you don’t believe my comments on this site,there can be no understanding between ourselvesc,can it?.I have written what I know for sure.The problem here is the mistrust between our people.Your writing is based on the Greek,and Bulgarian propaganda.Macedonia does not occupy foreign land,it is our neighbors who do as of 1913. On the Kapelaris issue,I even gave you the number of the protocol,how much proof you want?. You claim,we are either Greeks or Bulgarians,which none of it is true.The fact is,we in Greece some have been hellenized,same goes in Bulgaria,and did happened during the Serbiab reighn over present Republic of Macedonia.Look,in Albania,both Macedonians and Greeks have been united in the fight against the Albanian government for not recognizing the two ethnics during the census not long ago.Where do I get my information?.Internet is wide open.On Rallis statement,just go to the “New York Times”archives you will find it.I can’t bring you the archives on my own,all you do,click on it.I don’t know how much proof I can give you to make you believe my friend.If we don’t believe what’s written in the news media,internet or history books,than why are we reading?. On Samaras issue;he was sued by the Hellenic Repunlic,and found not guilty by the courts in Athens.The judgement was not guilty because it was for “patriotic”reasons(againts the Republic of Macedonia and the Macedonian minority in Greece.This is why Greece would like to see Crvenkovski as PM.He received a lot of money from Greece.I can tell you one thing for sure,he will never come to power again with his cronies who were paid by Samaras. Dimitri,you continue to refer to the Macedonians as Bulgarians,you are communicating with a Macedonian.How would you like me to refer to you as a “Turk”?. des,Deltcheff was born in Kukush just north of Salonika Aegean Macedonia under the Ottoman Empire.Please,don’t give me the Bulgarian crap!He as I are Macedonians!